Little bluestem grows on the 27-acre Blackland prairie remnant in Crawford Memorial Park. Courtesy of iNaturalist/Tania Homayoun. Are you a vertical snob, impressed only by the tall? Does nature have to be literally in your face like trees or mountains to get your attention? Is the sky separate from the landscape? Is dirt just dirt to you? Answer yes to these questions and it’s clear prairie seeking is not your thing. A prairie is vast and horizontal, indivisible from the sky that arches over it. Yet it’s best appreciated on your knees to grasp the intricate miniature rainforest-like ecosystem it is. Layers of greenery and microclimates in the first two feet create a riotous diversity of plants, made possible by a soil that has never been disturbed, whose networks of fungi and microorganisms called a biome thrived intact for many thousands of years. Crawford Memorial Park in southern Pleasant Grove/southeast Dallas contains just such a place. In this 266 acres divided by Prairie Creek, the northern two-thirds is developed parkland with a 2.7-mile paved loop trail. But the undeveloped southern third features more than 27 acres of Blackland Prairie on a wide curved slope leading down to the creek. A visit to Crawford’s Blackland Prairie can be a perception-shaping experience. On a balmy winter Saturday, my hiking companions and I had the wild southern end all to ourselves. After taking the paved trail past the widely spaced Post Oak Savannah trees on the park’s western side, we exited the manicured maintenance and zig-zagged through the unmowed savannah area, a bit too overgrown with privet and poison ivy. Indian Grass at Crawford Park. Courtesy of iNaturalist/Sam Kieschnick. We kept going southwest until we met the main trail (actually a park maintenance road) and headed south. The landscape opened dramatically into acres of tall, strappy Indian grass leaves topped by delicate feathery seedheads. Little bluestem’s tangle of long, thin pointed leaves grew profusely where the bigger grasses did not flourish, signaled by stiff stems ending in an upturned wedge of fluffy burnt-red fibers. The wind made the tall dried grasses rustle and bend. Possumhaw. Photo by Amy Martin. The prairie spread out in a broad bowl until the distant tree line. Cardinal berries of possumhaw and burgundy foliage of sprawling dewberry patches stood out. We headed down the main path in the brilliant gentle sunlight. Critter trails and field mice tunnels were easy to see in the dense foliage. Red-tail hawks and turkey vultures swung through the skies. The air smelled clean, even with US 175 nearby, without a forest mustiness or the urban mélange of tailpipe exhaust and frying grease from fast-food places. Our goal was the Prairie Creek riparian corridor, meandering our way to a dilapidated trestle, part of an abandoned railroad line that forms the prairie's west side. Plans are to pave a path on the line and link it to the city’s expanding bike-and-bike trail system. The creek has steep chalk sides five to 10 yards deep and is not as trashy as many urban ones. Plentiful inland sea oats and even horsetail reed grew on the bank. Hardwood trees were an impressive two to four story, 50 to 120 years old. Poison ivy is impressive, too. Prairie Creek runs through Crawford Park. Photo by Amy Martin. On a recent scouting, Brett Johnson, urban biologist for the city of Dallas, was surprised by the condition of one of the largest prairie swaths in Dallas. A 360 view of Crawford. Video by Amy Martin. Compact prairie clover. Courtesy of iNaturalist/Sam Kieschnick. There’s also not as much invasive plant material as Johnson thought there’d be, good fortune he attributes partly to the natural area bordered by a riparian corridor, highway corridor and small industrial district, rather than homes with all their woody Chinese landscape plants. For thousands of years, the Blackland Prairie remained a grassy fecundity due to herds of buffalo and other ungulates that find small trees to be tasty. Periodic wildfires recharged the prairie soil and further kept trees limited to waterways and sheltered places. Somehow the prairie at Crawford has flourished even though lacking in those mega influences. But a few small trees are creeping in. Bindweed. Courtesy of iNaturalist/Sam Kieschnick. Roger Sanderson of Texas Discovery Gardens and John Wilt, a North Texas Master Naturalist, provide a vital assist to Johnson in Crawford recovery efforts. Colorful ground flags in the prairie placed by them identified milkweed patches and other significant plants worth monitoring. The fall 2017 BioBlitz put Crawford on the North Texas naturalists’ maps, earning it a significant entry on iNaturalist. The event logged 53 plant, bird, bug, and mammals species. A key reason for the better-than-average numbers is its two other native ecosystems. Bobcat print. Courtesy of Amy Martin. A nearly 50-acre swath of reddish sandy loam soil dominates the park's Post Oak Savannah western side. Tall pine trees in the northwest corner stand out. Then it eases into widely spaced, straight and sparsely branched post oaks and blackjack oaks. Woody encroachment is kept at bay by mowing. A long-term proposal is to restore the scraggly, erosion-weary turf with short native grasses such as eastern gamma. Cricket frog is one of the critters spotted at Crawford Park. Courtesy of iNaturalist/Sam Kieschnick. As the Post Oak Savannah leaves the mowed developed parklands, it struggles with privet-encroachment. There were heartening patches of openness amid the brush and birdsong was omnipresent as we passed through. Poison ivy was significant in a few areas, even though the soil tends to be dry. Most of the way through the savannah is an easy, meandering walk. Rounding out the park is an Austin Chalk Escarpment on the southeast end flanking Prairie Creek. The area is profoundly damaged by ATV and motorcycle use, now forbidden, but still persisting. The soft white rock with its scrappy yaupons and live oaks line a brisk creek, projecting a Hill Country vibe. 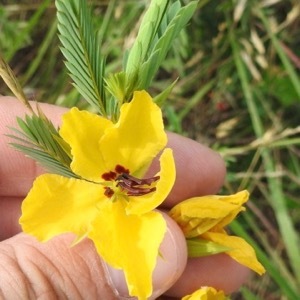 Partridge Pea. Courtesy of iNaturalist/Sam Kieschnick. About: 266 acres divided by Prairie Creek. The northern two-thirds is developed parkland with a 2.7-mile paved loop trail. The undeveloped southern third features more than 27 acres of Blackland Prairie. Where: 8700 Elam Rd, Dallas, TX 75217. Near where Elam or Prairie Creek Rd. and US 175 meet, just east of S. Buckner. It is about three miles east of the Trinity River Audubon Center. Parking: To access the southern third, park in the southernmost (of two) parking lots on Prairie Creek Rd. Otherwise, parking is on the north end by the sports fields on Elam. Trails: From the southernmost parking lot, take the paved loop trail to the southwest. It will dip down and cross over Prairie Creek on a steel bridge. The picturesque low area was a significant pond before its spillway ceased to hold water. Rise and pass through a small picnic area. Look for light-colored, soft-surface unofficial trails to your left, or south, through the Austin Chalk Escarpment. Trail map. 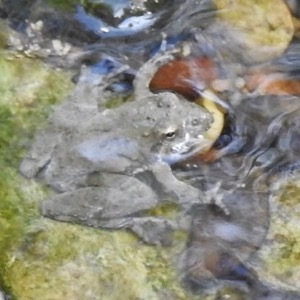 North Texas Wild is a monthly column on GreenSourceDFW.org by Amy Martin.